It was a broadly strong week for US equity indexes, with net gains ranging from 4.2% (Nasdaq comp'), 2.4% (sp'500), to 1.1% (Transports). 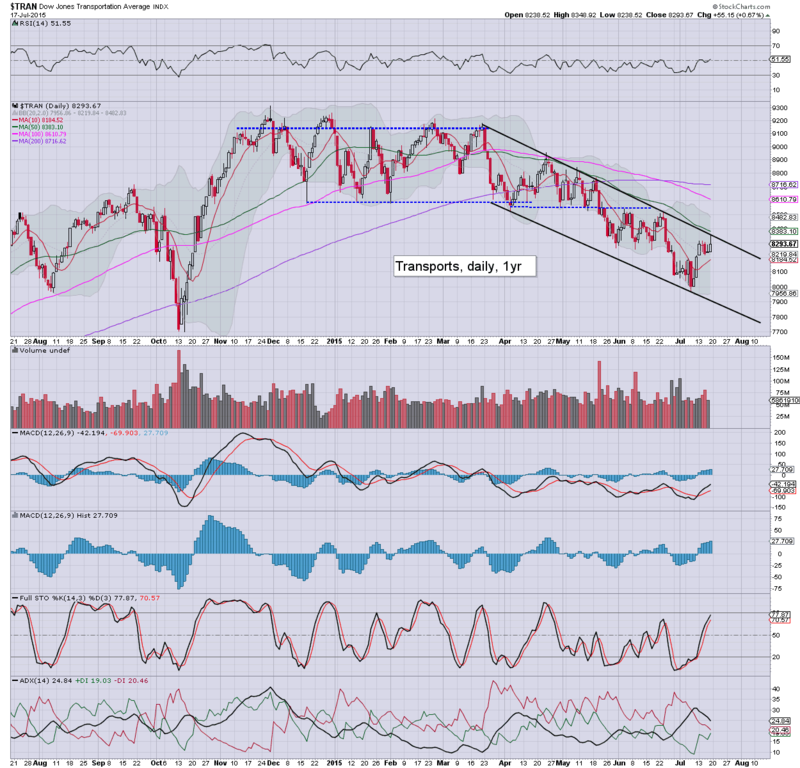 Near term outlook offers a few days of weakness, before renewed upside into August. 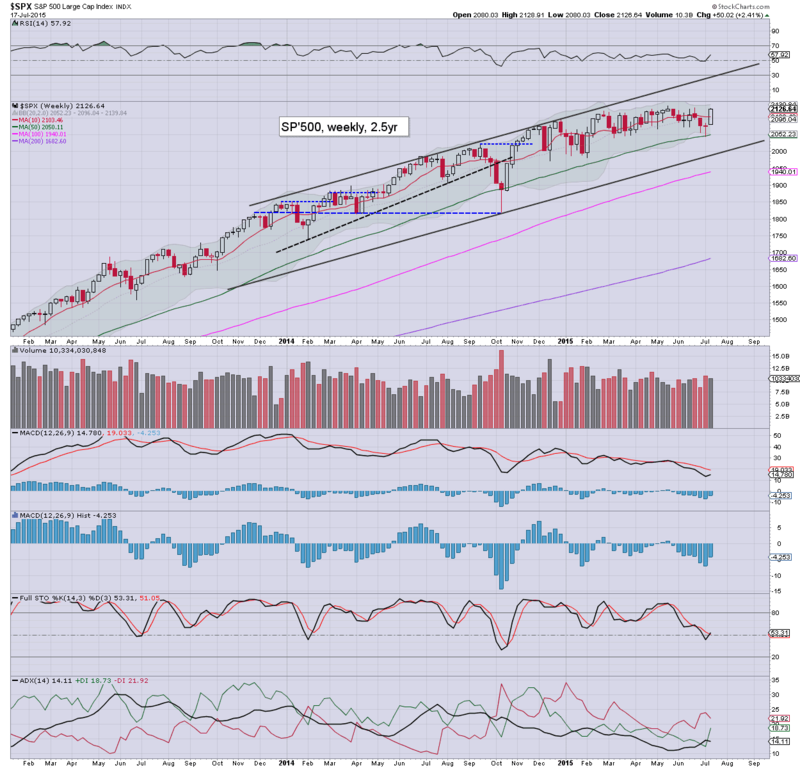 The sp'500 saw a net weekly gain of 50pts (2.4%), with a Friday high of 2128, a mere 6pts shy of the May high of 2134. Underlying MACD (blue bar histogram) cycle ticked higher, and is set to go positive as of Monday July 28th. 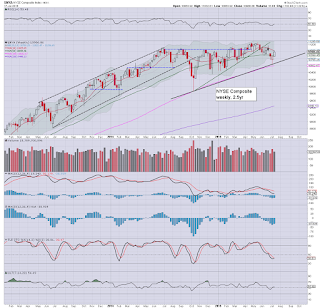 There is immediate viable upside to around 2140. From there, given another 2-3 weeks, the 2180s look just about possible, which would be a key hit of the upper bollinger on the giant monthly cycle. Key rising support by end August will be around 2125. A break < 2K would be very significant, and open the door to 1950/1850 zone by early October. 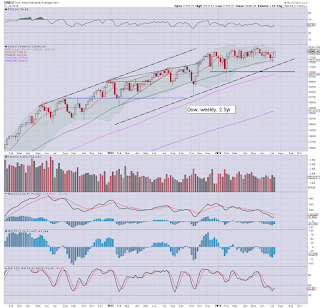 On no outlook do I see sustained action <1800 this year...or next. 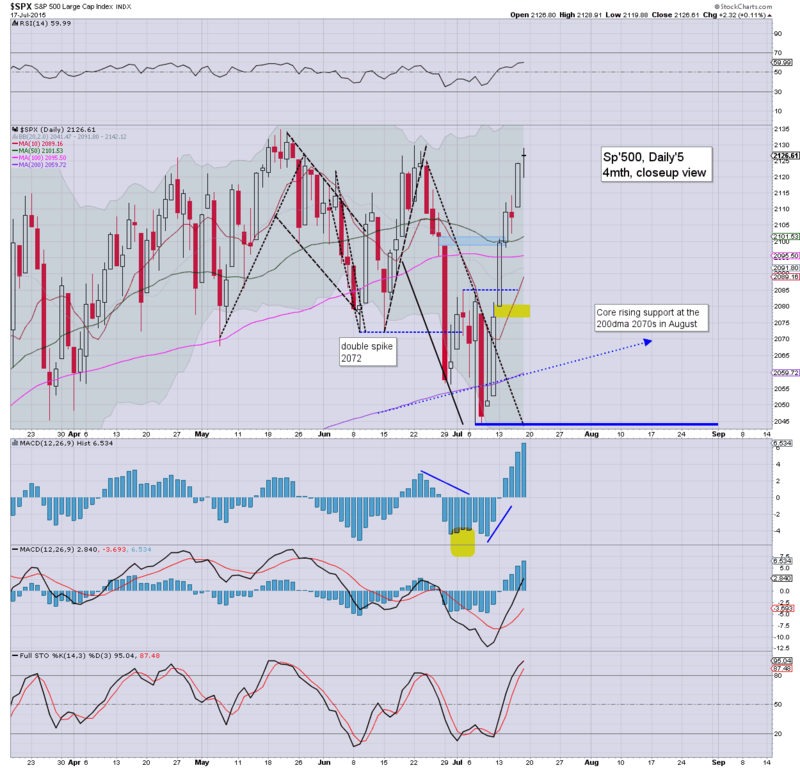 Best guess remains, a few days of weakness in the immediate term to 2090/80, and then renewed upside into August. The tech' is leading the way higher, +4.2%, with a new historic high of 5210. Clearly though, there is resistance just a little higher, around 5225/50. The Dow climbed 326pts (1.8%) to 18086. Broadly, the Dow has been stuck since February, although it did make a marginal new historic high of 18351 in May. Underlying momentum remains negative, and it will take at least 2-3 weeks to have a chance at seeing a bullish cross. Best case downside remains 16500/000 by early October. In the scheme of things though, it really isn't that bold a target, and would only take the Dow back to levels from last October. The master index gained 1.2% this week, and remains stuck since February. At best... the 11300s look viable in August. 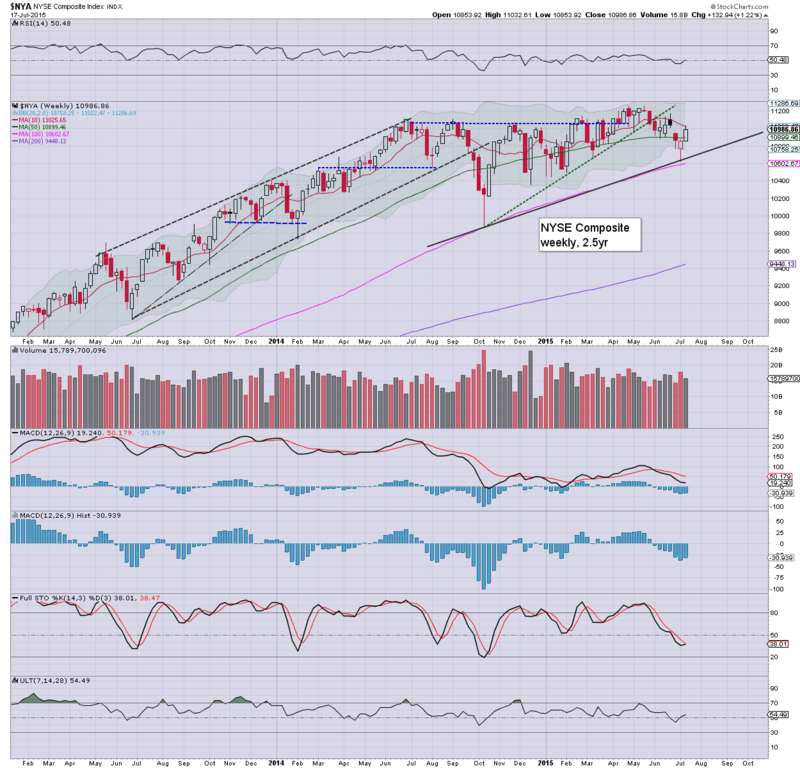 Key support in early Sept' will be 10800, with viable downside to the 10300/000 zone. Sustained action <10k looks unlikely. 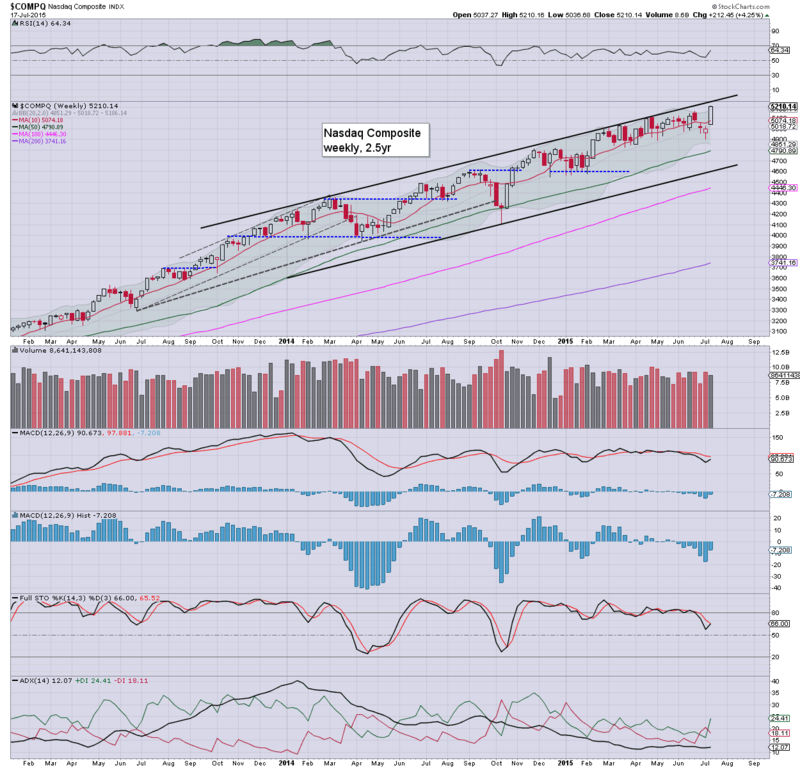 The second market leader climbed for the second consecutive week, with a net gain of 1.2% @ 1267. Sustained action much above the 1300 threshold looks difficult. First downside is the 1200 threshold. 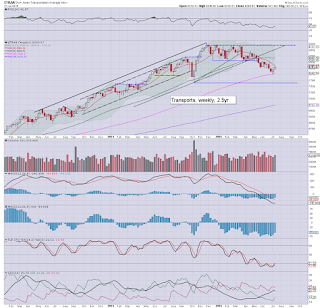 Under no realistic outlook does the Oct' 2014 low of 1040 look able to be broken. 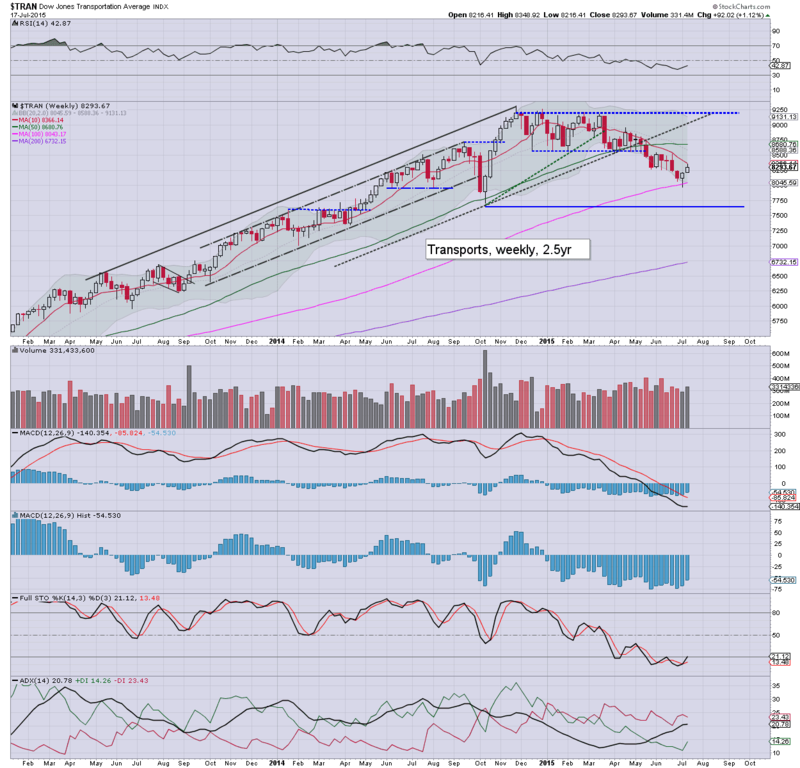 The Transports continues to be the market laggard, seeing a net weekly gain of only 1.1%. The broader downward trend from the Nov'2014 high of 9310 remains intact. 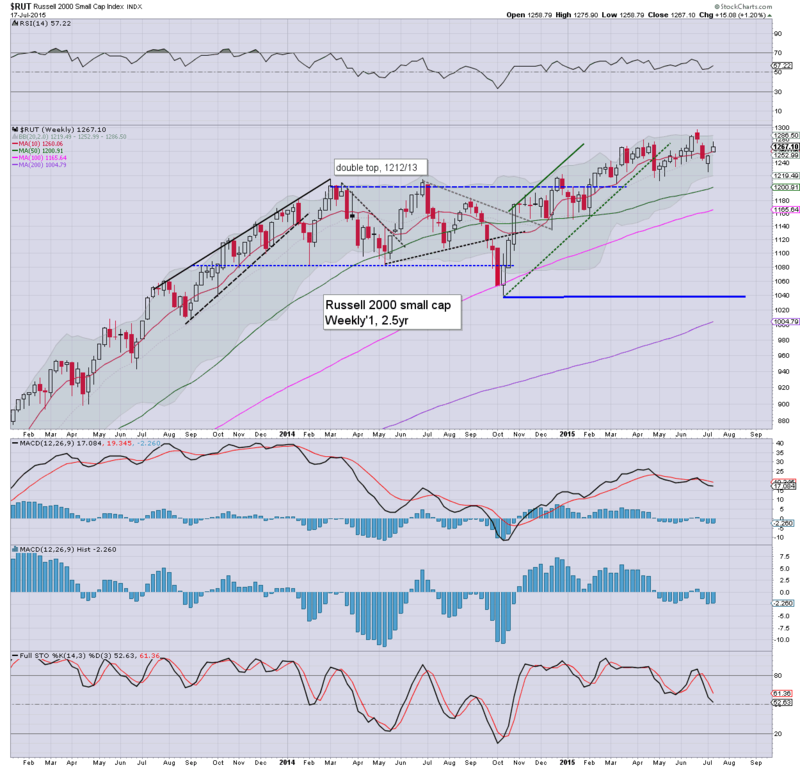 At best, the equity bulls might be able to push upward to around 8600. 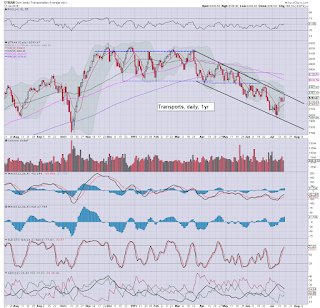 Subsequent downside to at least 7700 is then anticipated. Best bearish case is the 7500/300 zone. 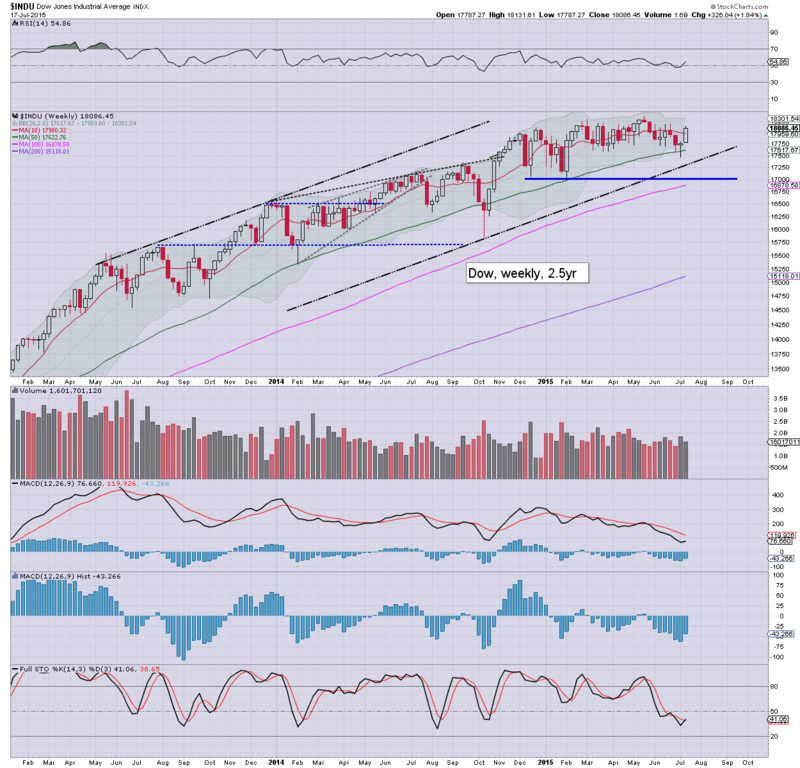 Last weeks spike low was confirmed with sig' net weekly gains across all indexes. Many indexes have been clearly stuck for most of the year, even if some did manage marginal new historic highs. Best guess... a few days of weakness... with another 2-3 weeks of upside, before first chance of a key turn lower around mid August. The fact the Nasdaq broke a new historic high on Friday does bode in favour of the sp'500/Dow breaking marginal new highs in August. 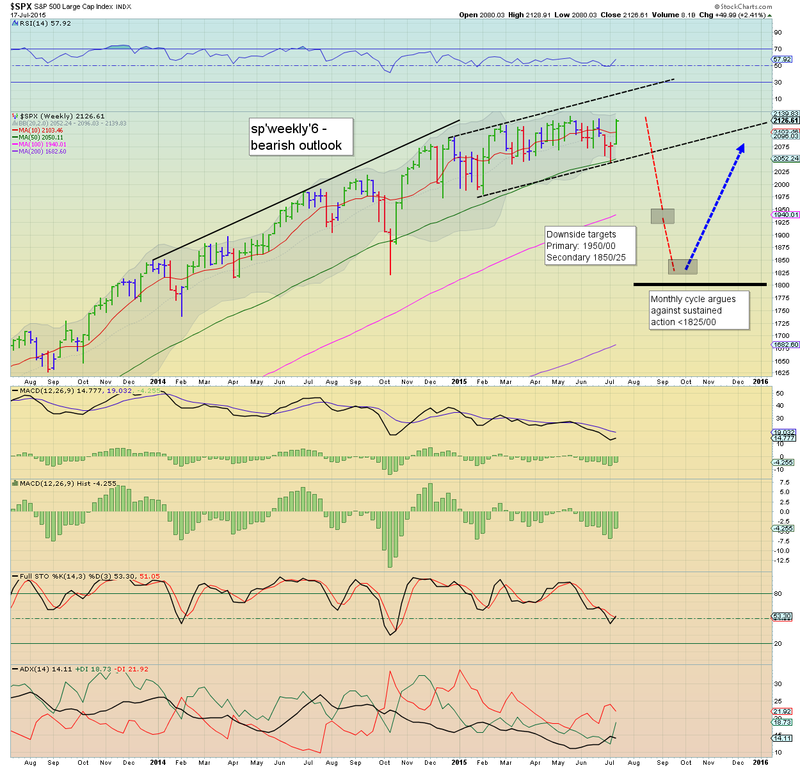 I suppose the new up cycle could drag out into September, but that looks unlikely. After all, the bigger monthly cycle turned negative five months ago... price momentum is increasingly favouring the equity bears. There is very little scheduled in the coming week. No doubt though, the ongoing Greek situation will periodically generate a few news headlines. 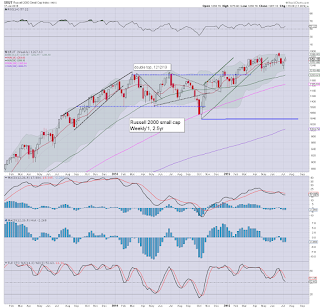 Regardless of any equity weakness in the first half of next week, the US market looks set to climb into August. 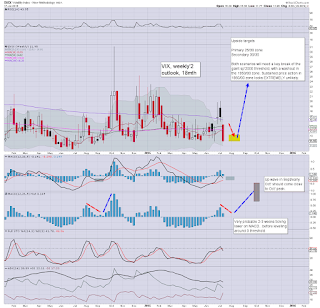 The bigger equity-short/VIX-long trade does not look viable for at least another few weeks. It has been another long week. Suffice to say, I will be increasingly referencing the above two charts across the next few months. 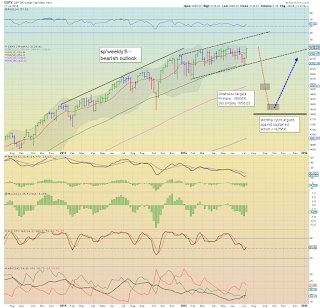 A break under the giant sp' 2K threshold looks due in the late summer. For now... it is mostly a case of sitting on the sidelines, and await a better setup. 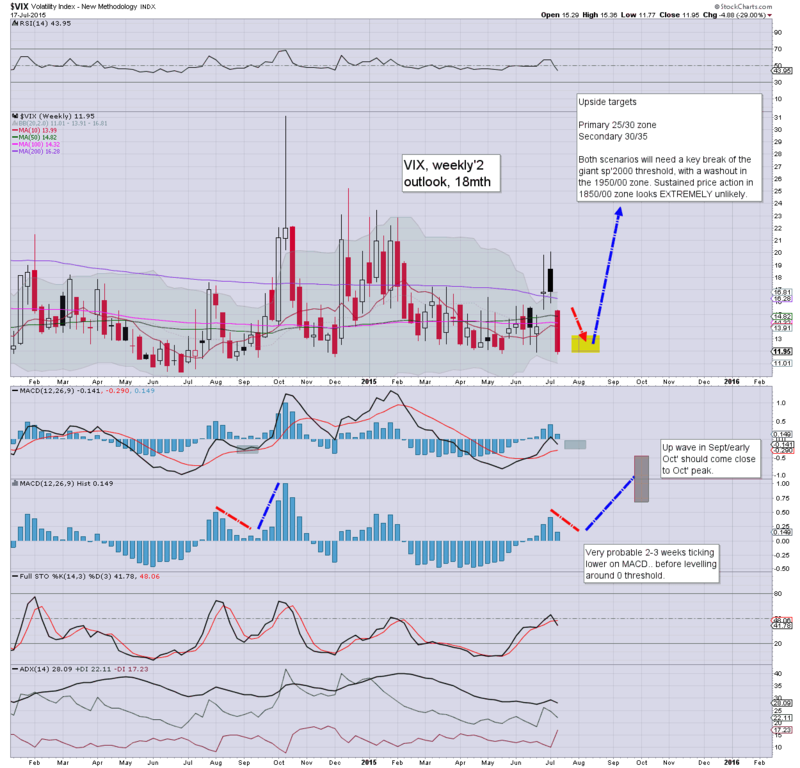 Eyes on the VIX weekly cycle... in early August! US equities closed somewhat mixed, sp +2pts @ 2126 (intra high 2128). The two leaders - Trans/R2K, settled +0.7% and -0.4% respectively. 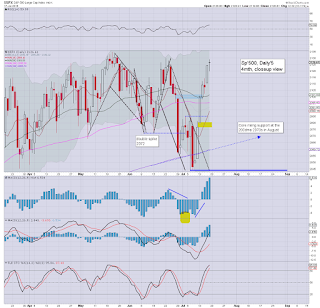 Near term outlook offers a retrace to the sp'2090/80 zone - along with VIX 15/16s, before renewed upside into August. *Transports remains the market laggard. The daily closing candle was a clear spike-fail at declining resistance, and does bode in favour of equity bears early next week. So, a new cycle high of sp'2128, that makes for an 84pt (4.2%) gain across just six trading days. 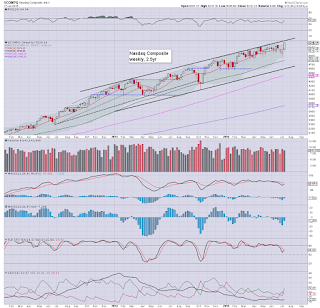 Regardless of any weakness next week, the issue now is whether sp'500 can break a new historic high >2134. 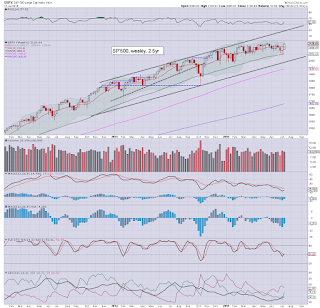 The bigger weekly cycle will be offering the 2140s next week, anything much above 2150/60 will be difficult.